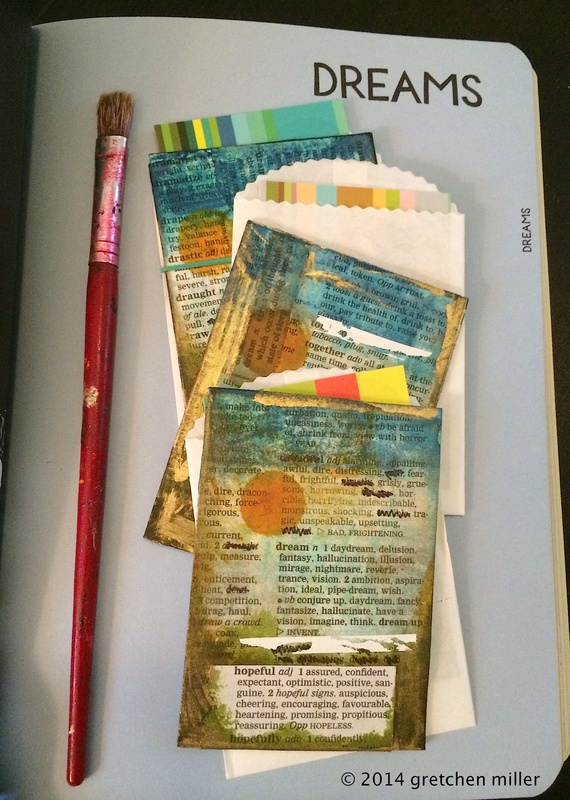 6 Degrees of Creativity 2015 Workshop Reveal! 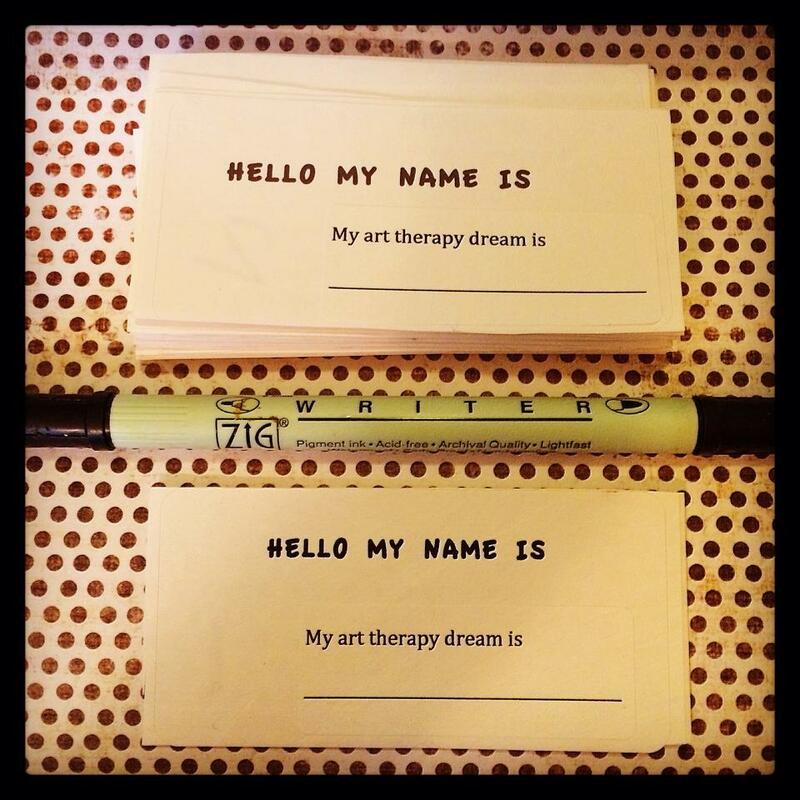 Excited to be organizing another round of 6 Degrees of Creativity workshops! Get ready for a new wave of creative goodness! 6 Degrees of Creativity’s online workshop offerings unite concepts of social networking, connecting, collaboration, art making, and creativity into a community of artists exploring transformation and creative goodness. It is a self guided (which means you can go at your own pace!) 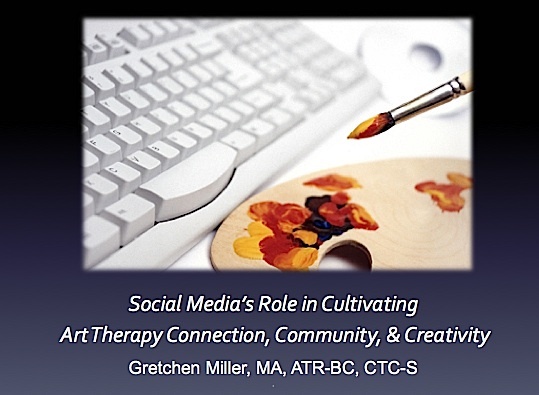 6 month virtual experience running from July – December 2015 that includes a collection of inspiring offerings, designed by a group of instructors from the art therapy community. The basic foundation of 6 Degrees of Creativity empowers the idea that we are all closely connected in some way and believe in the potential to make a difference through the power of art and creativity in our own lives, relationships, communities, and world. 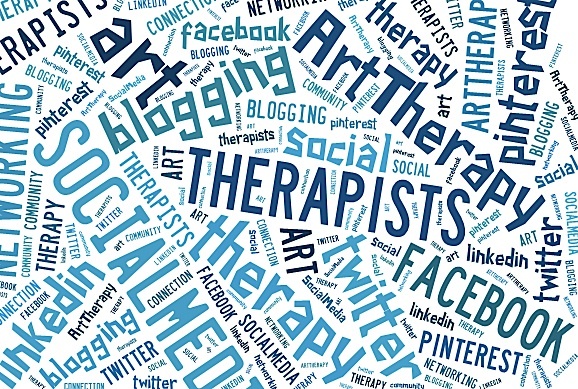 6 Degrees of Creativity instructors, who are all active and engaged in their own art-making practice, will offer creative expression to explore and empower these themes. Hooray! Springtime is just around the corner— After this cold, cold winter I can’t wait for warmer weather, fresh spring air, more sunshine, and longer & longer days full of light…. Bring it on! 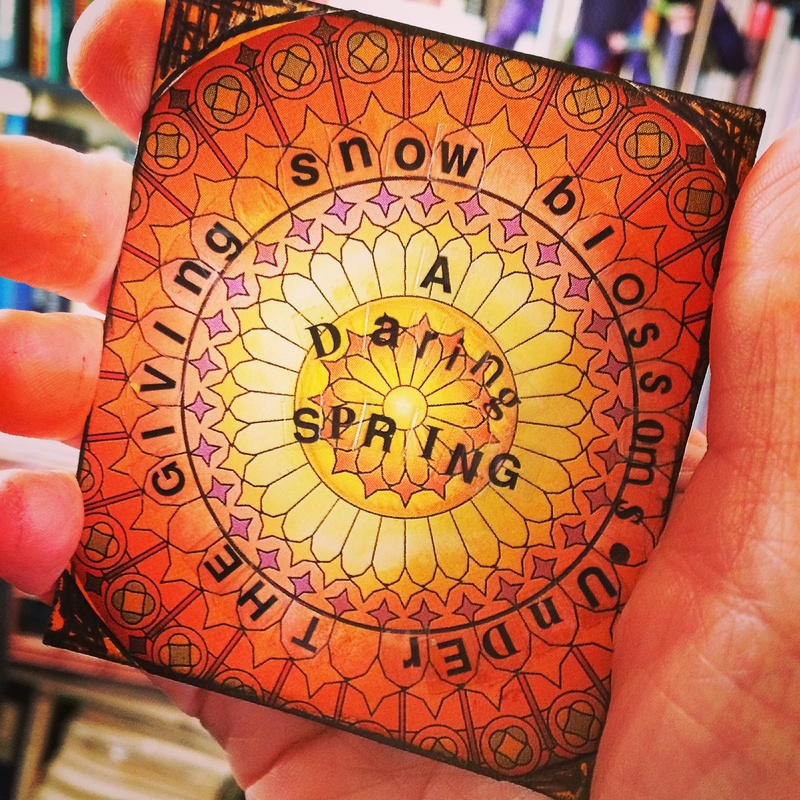 I wanted to share some of the springtime creative happenings & goings on I’m excited to be a part of over the next few months…as well as offer a First Day of Spring Giveaway to readers of this blog! 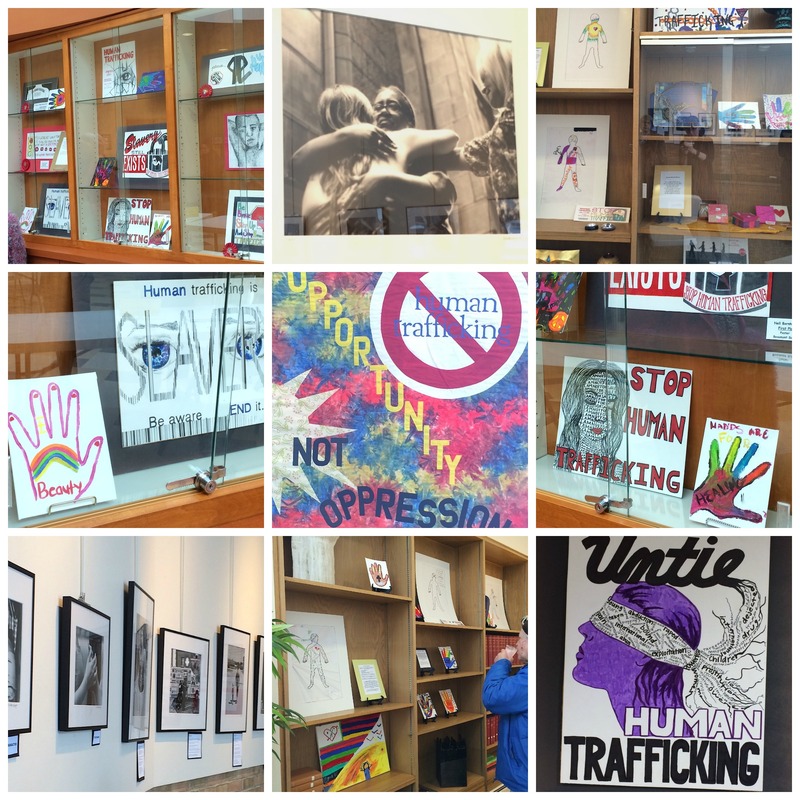 Until April 25- Human Trafficking in Art, an art exhibit at West Shore Unitarian Universalist Church in Rocky River, Ohio features art created at the Renee Jones Empowerment Center with survivor’s of human trafficking and at-risk teens I’ve been working with involved in the Center’s Project Red Cord. You can also read more about the exhibit here. 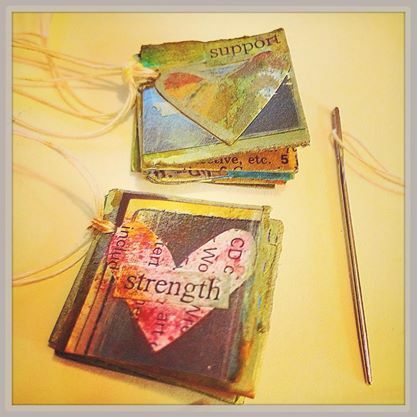 On April 19, I’ll be speaking at WSUU’s Morning Forum to talk about the benefits of trauma intervention through art therapy to help trafficking survivors. 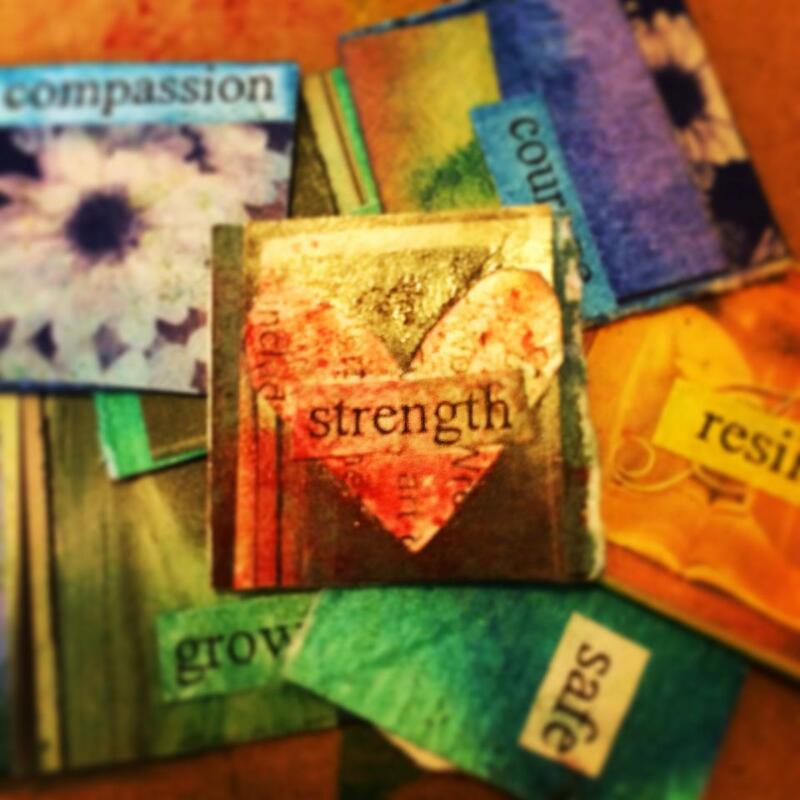 April 2- Strengthening Emotional Resilience through Art Journaling Workshop with The Alcohol, Drug Addiction and Mental Health Services (ADAMHS) Board of Cuyahoga County Staff as part of their Employee Wellness Program. 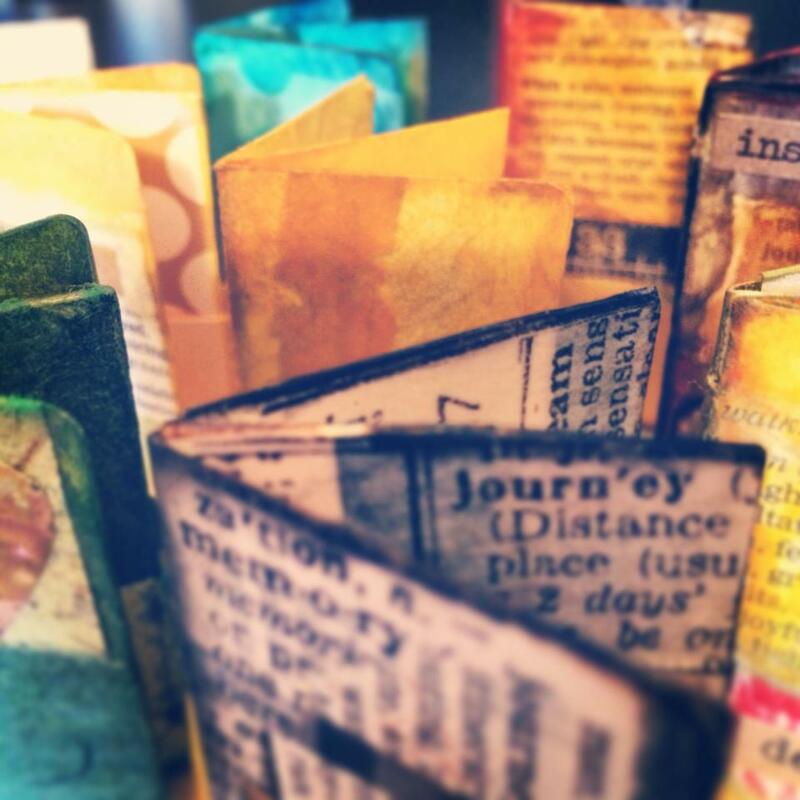 This offering of art-making and creative expression will focus on creating a small, mobile art journal that can serve as a tangible reminder of emotional resilience, support and the importance of self-care for the work providers do in service & care of others. April 18- As part of the Cleveland Association for the Education of Young Children (CAEYC) Spring Confere nce, “Creating a Peaceful Environment in a High Stressed World”, I will be facilitating the afternoon breakout session, Peace Begins with Me: Creating Peacemakers through Creativity. This session will introduce strategies important to facilitating group work that focus on peacemaking themes with children who have been exposed to domestic violence, bullying, and relational aggression. 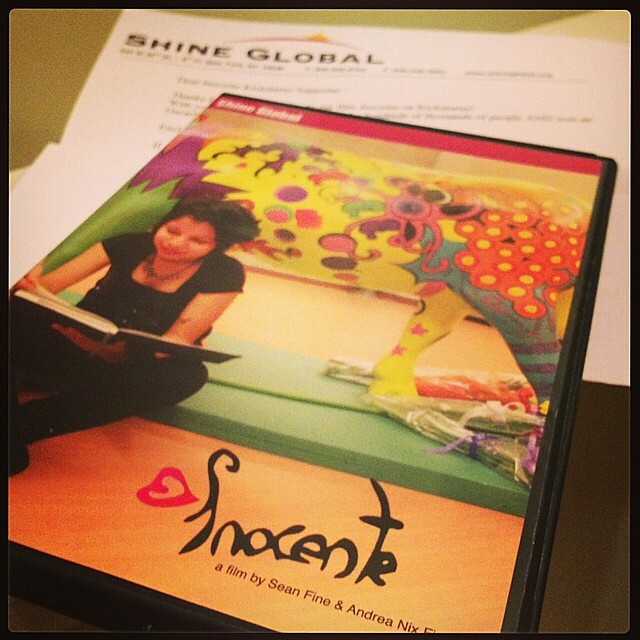 Content presented will help participants gain a trauma informed understanding about how these strategies and interventions promote safety, emotional expression, and coping. Registration is now open here. 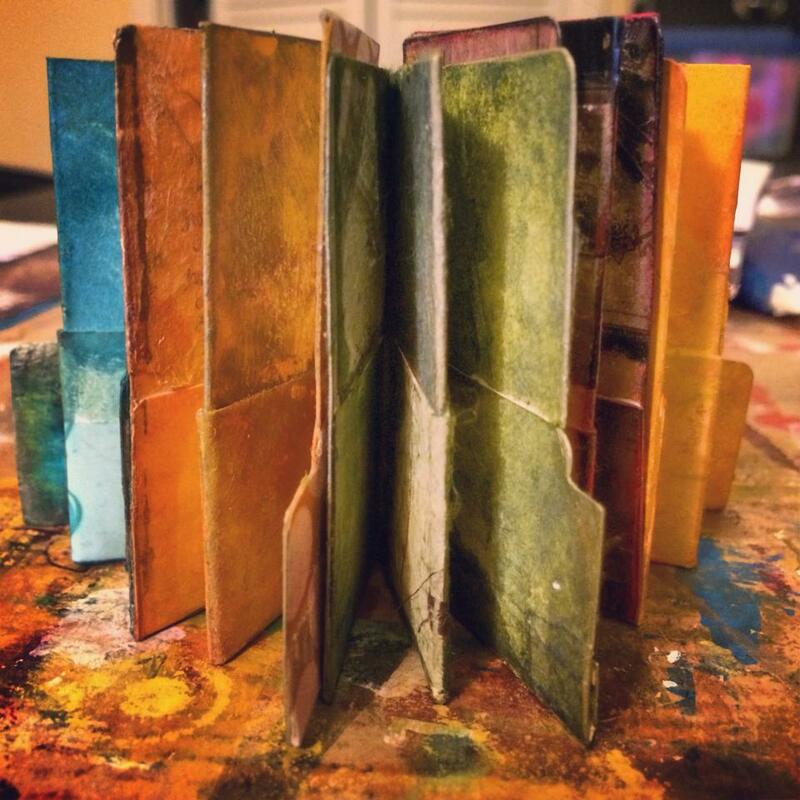 Openi ng May 1: As I announced earlier in the year, I’ve been invited to participate as part of this year’s Spectrum Teaching Collective with 25 other artists and creative offerings dedicated to celebrating your Mind~Body~Spirit~Nature through art…. and I can’t wait! 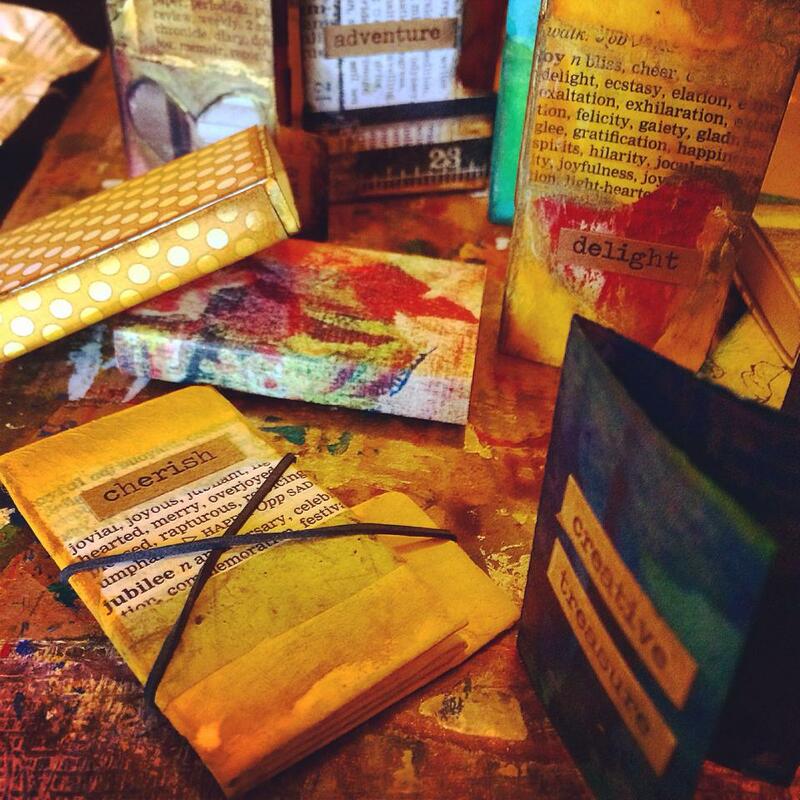 I am looking forward to introducing my new workshop, Creative Covenants to explore the values that are core to the way you create, practice, and live as a creative and artful being and meeting everyone coming together in this community! Learn more about Spectrum here. 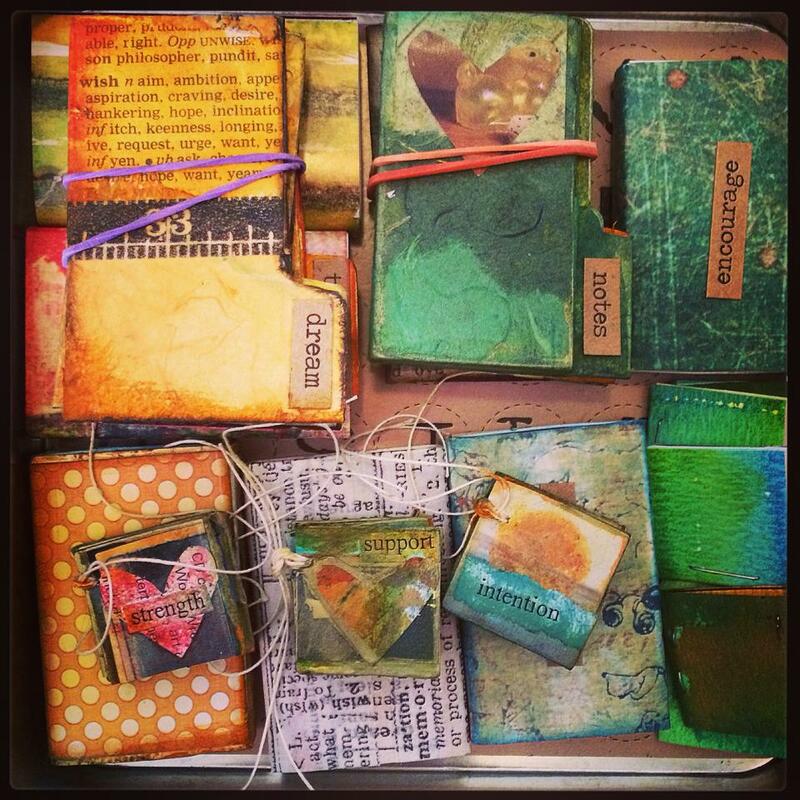 Random Acts of Art Adventure- Spring 2015: This 6 Degrees of Creativity Project and canvas pouch filled with art making stuff & traveling all over the world just wrapped up its tour in Australia! Next stop on its creative travel itinerary is New Zealand and then the adventure will be returning back to the states later this spring for its final 12 destinations! Yay! Creative Deed 365: The beginnings of this year’s 365 Project definitely has helped bring some fun & more creative goodness to my (and hopefully others!) winter landscape, but I am realllly looking forward to leaving my creative deeds out & about without having to wear gloves and in more outside locations! 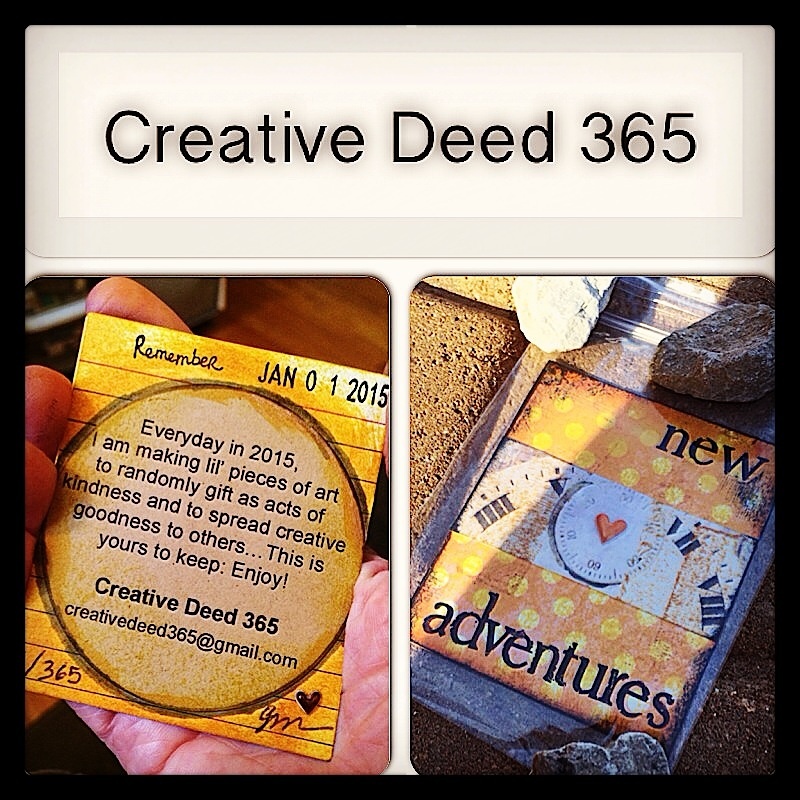 🙂 You’re invited to spring it forward with creating it forward by joining us in the Creative Deed 365 Group on Facebook to contribute your own art in the spirit of this project. And…A Special Springtime Giveaway: To celebrate spring approaching, I am doing a give-away for a complimentary registration to this year’s Spectrum with free access to all the workshop offerings: 25 contributors, 26+ workshop invitations, 6 months multi-media online community starting May 1 and running to the end of the year. To enter this special giveaway, please leave a comment below with what you love about spring! From these responses, I’ll put everyone’s names into one big collection & randomly pull one winner to announce on the first day of spring. Be sure to enter by Thursday, March 19 at 12noon (EST) to participate! I will directly contact the winner with the e-mail associated with your comment posting profile. Good luck! Enjoy the beginnings of this new season…..! 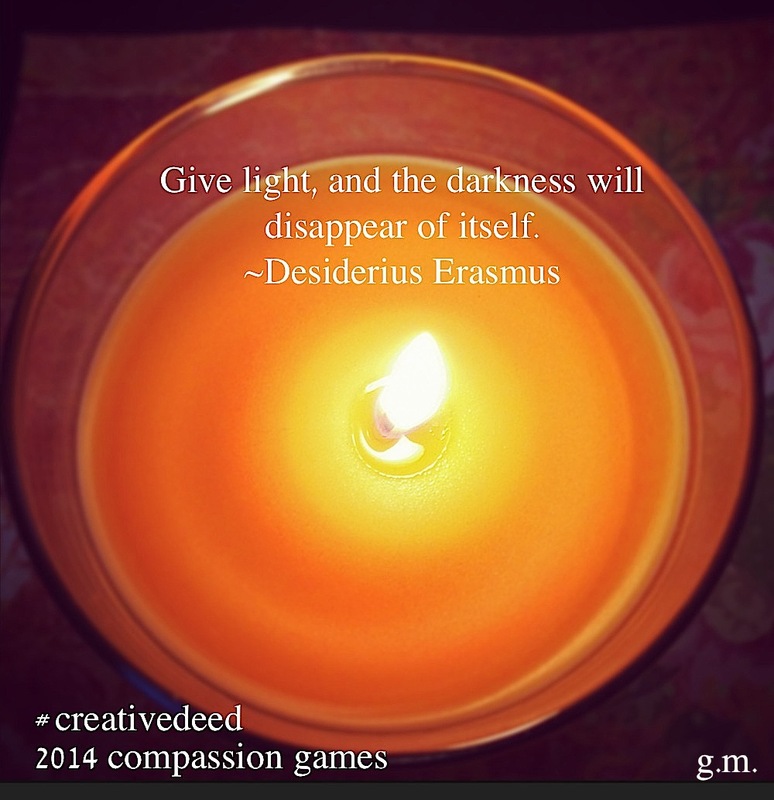 I just finished participating in this year’s Compassion Games with a team I organized through the 6 Degrees of Creativity community. 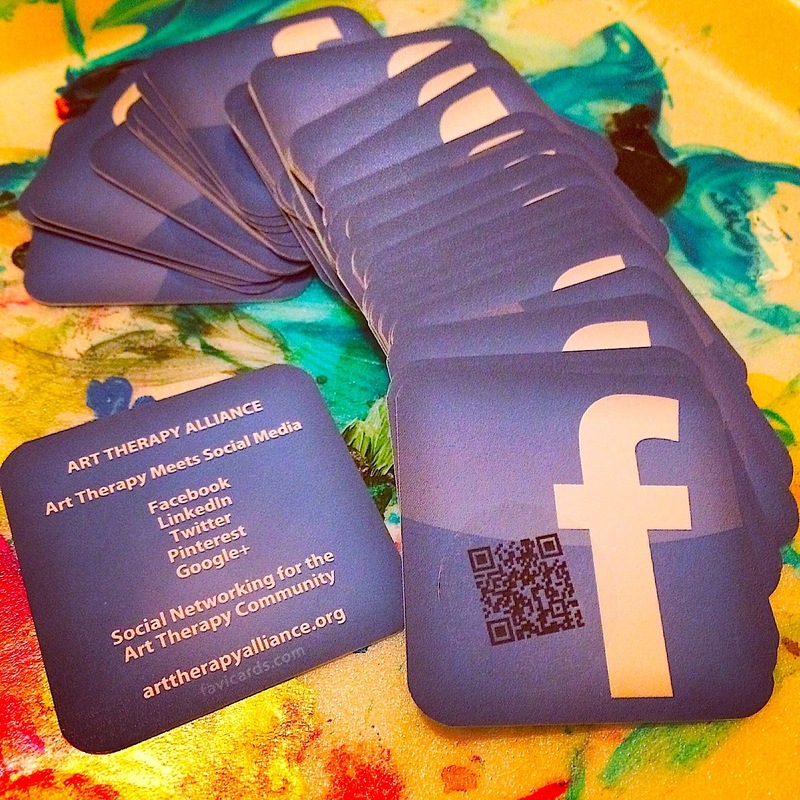 Our Creative Deed Team included a dozen a.maz.ing members from all over the globe! 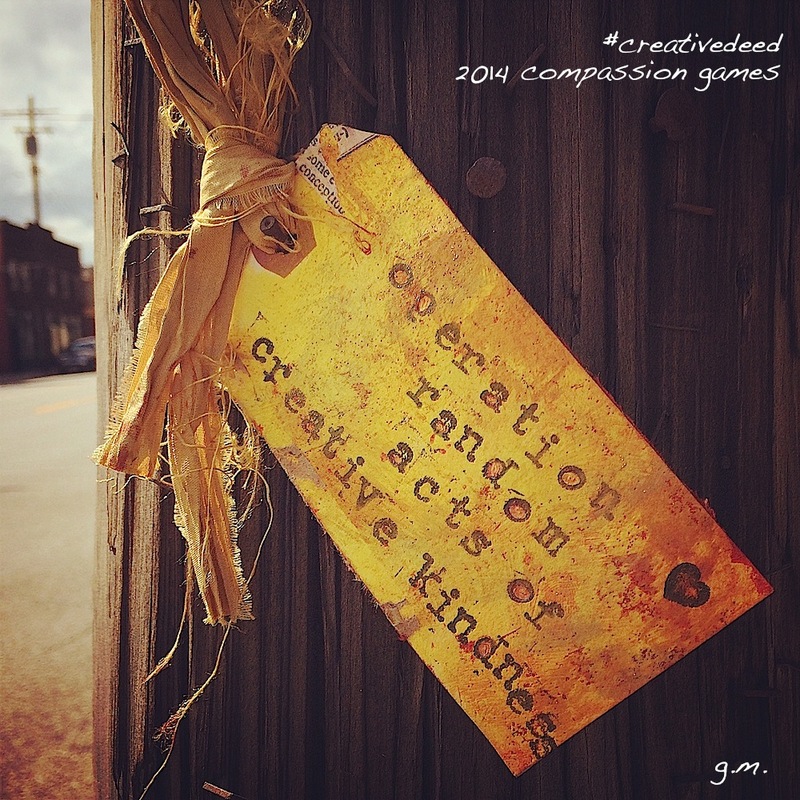 For 11 days, we worked on a series of artful acts that I sent out each day of the games to inspire kindness & compassion. 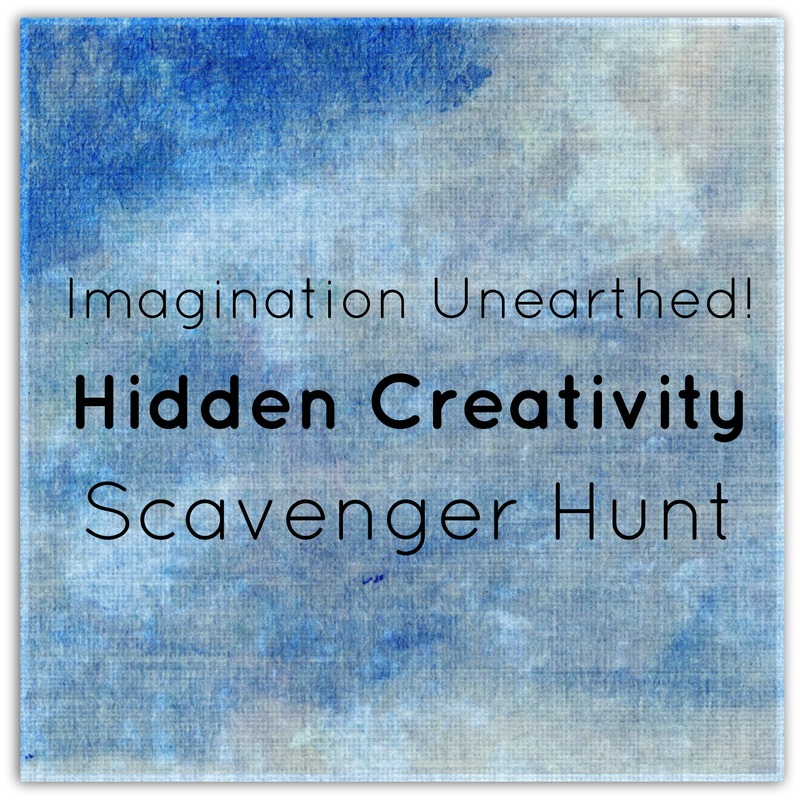 You can view the prompts for each of the Creative Deeds here. For the team’s first creative deed, I thought it would be a nice start to have each of us photograph a heart in the palm of our hand, as a symbol and offering of compassion. Below is a pic I took of my hand holding a glittery paper heart in my creative space, with a quote connected to service, compassion, and supporting of others. My love for making wordles and word clouds inspired Day 3’s Creative Deed, as team members were encouraged to experiment with free, online sites like Wordle, Tagxedo, and Word It Out to create Compassion inspired word art. My image was made using Tagxedo (love their shapes), using words from the quotes that inspired me during Day 1 and 2. 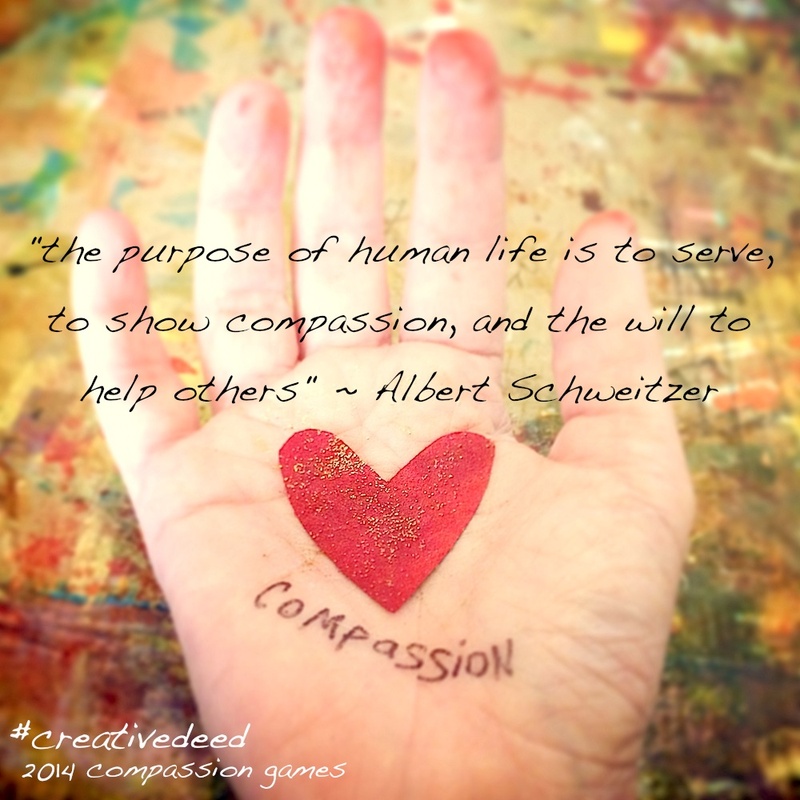 Day 5’s Creative Deed was inspired by a concept introduced in Seattle for the Compassion Games, in which individuals are nominated as Compassion All Stars. The Creative Deed Team nominated individuals in our lives and then made an award to recognize him/her. 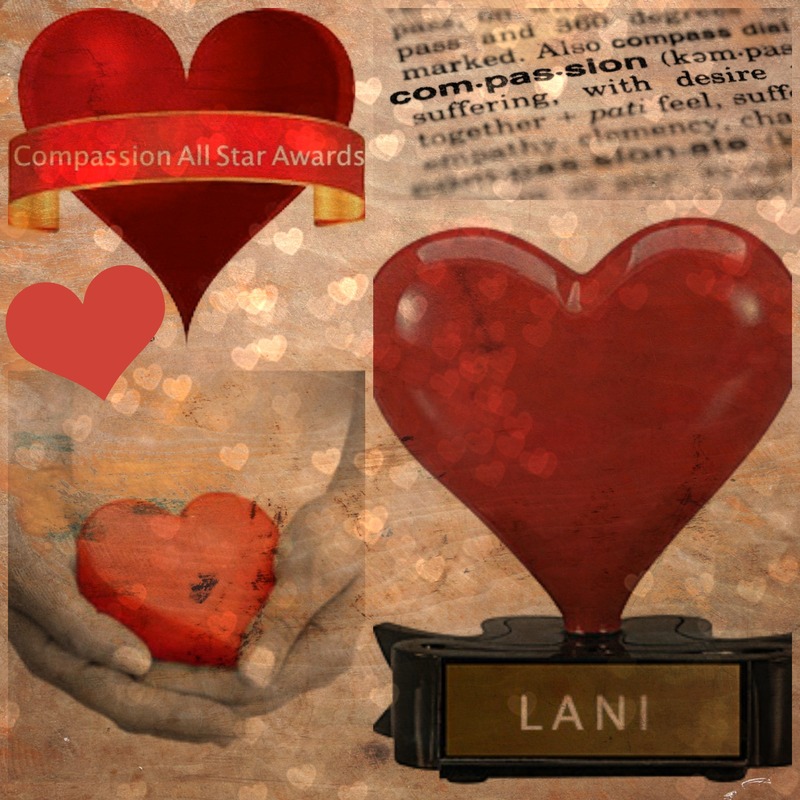 I nominated Lani Gerity as a Compassion All Star I am grateful to have in my creative life as a friend & colleague— Just visit Lani’s blog to take in all her compassionate and artful ways. 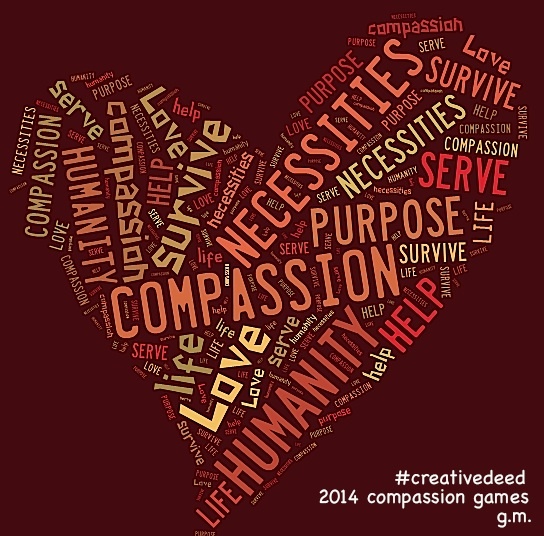 The next day the Creative Deed Team embarked on a Compassion & Creativity Quote Hunt and we used online programs like Recite and Quozio to transform these words into graphic designed images. 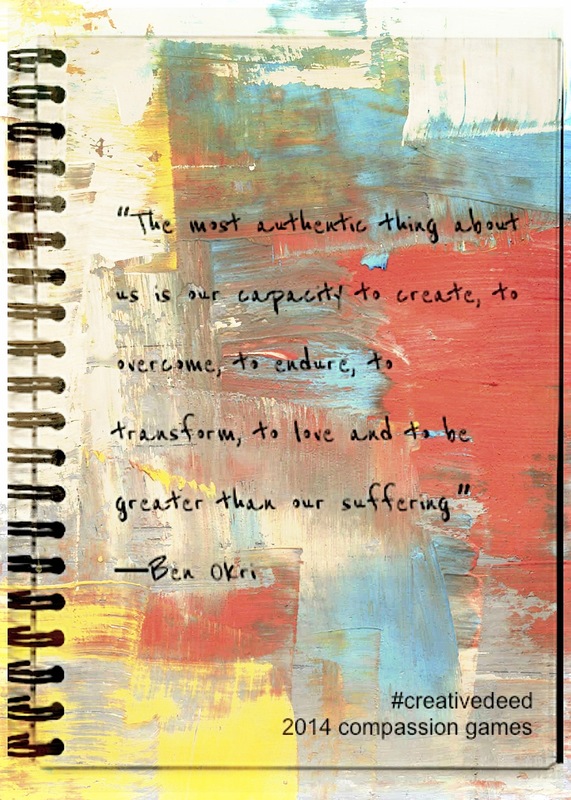 I chose one of my favorite resiliency based quotes from Ben Orki that I often use as an affirmation in my work. 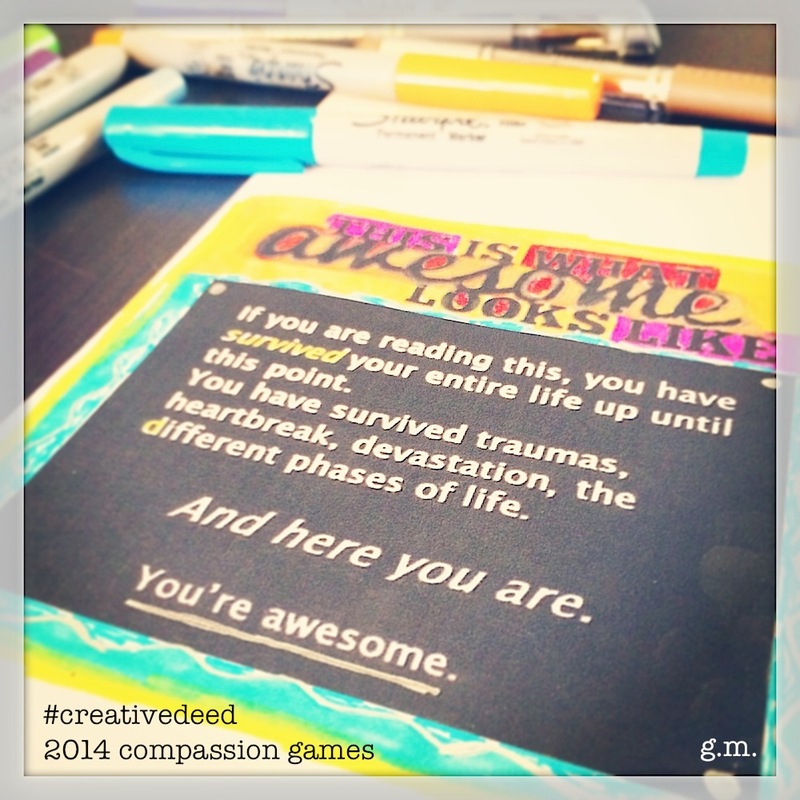 Day 7’s Creative Deed was dedicated to celebrating everything and anything awesome through making Compassion Cards of Awesomeness for ourselves & others. I stashed this Creative Deed message inside a random book. I think there is much power and strength in this quote. Day 9’s Creative Deed focused on mandala making with a compassion theme. A recent photo I took of a candle and its flame reminded me of a light bearing mandala and how light (giving & receiving) can bring an awareness of hope & clarity in times of distress and despair. 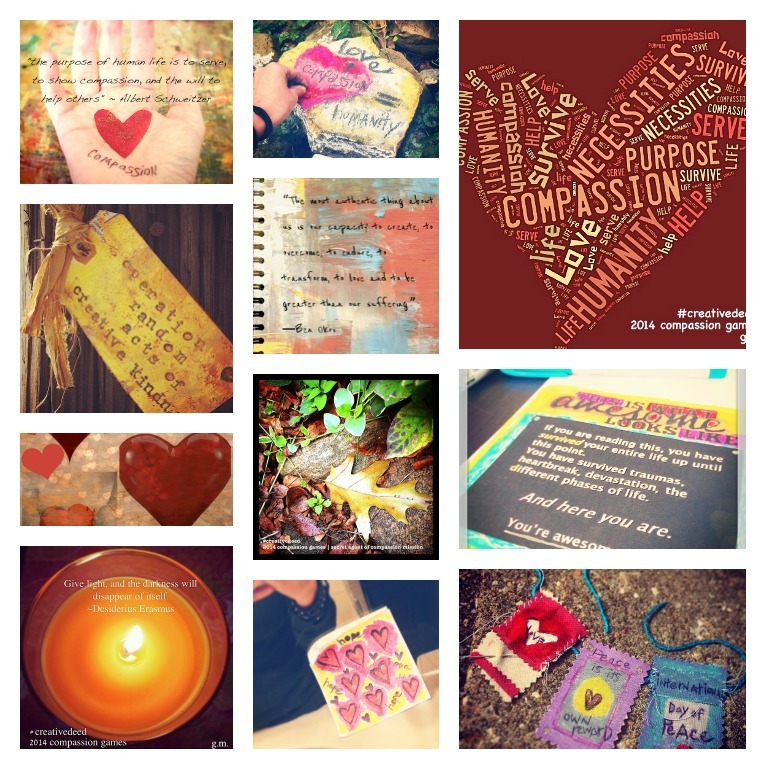 Sticky notes were transformed into Compassion Art on Day 10 as a way to publicly display positive messages of kindness. 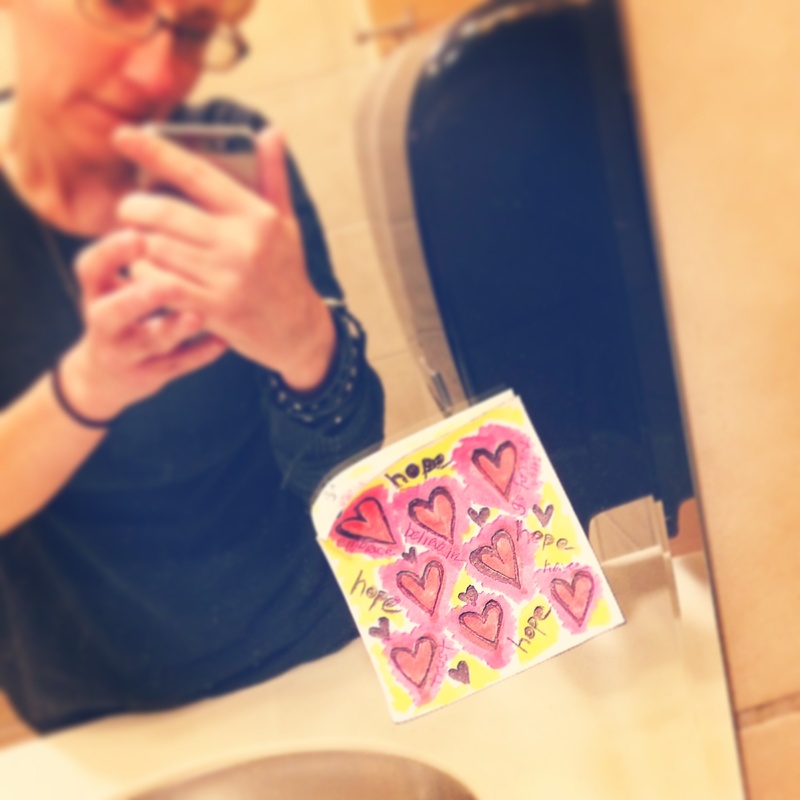 I left my sticky note art of hope on a restroom mirror in one of my favorite roadside travel stops on the way home from a trip. It included a message to have, trust, believe, and embrace hope. 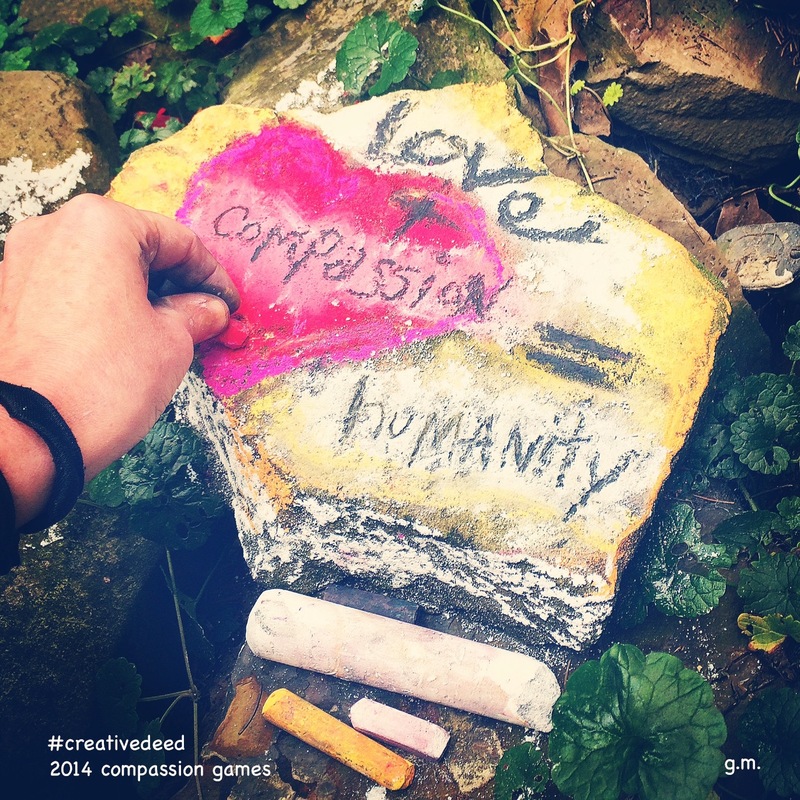 The final day of the Compassion Games ended on September 21, International Day of Peace. 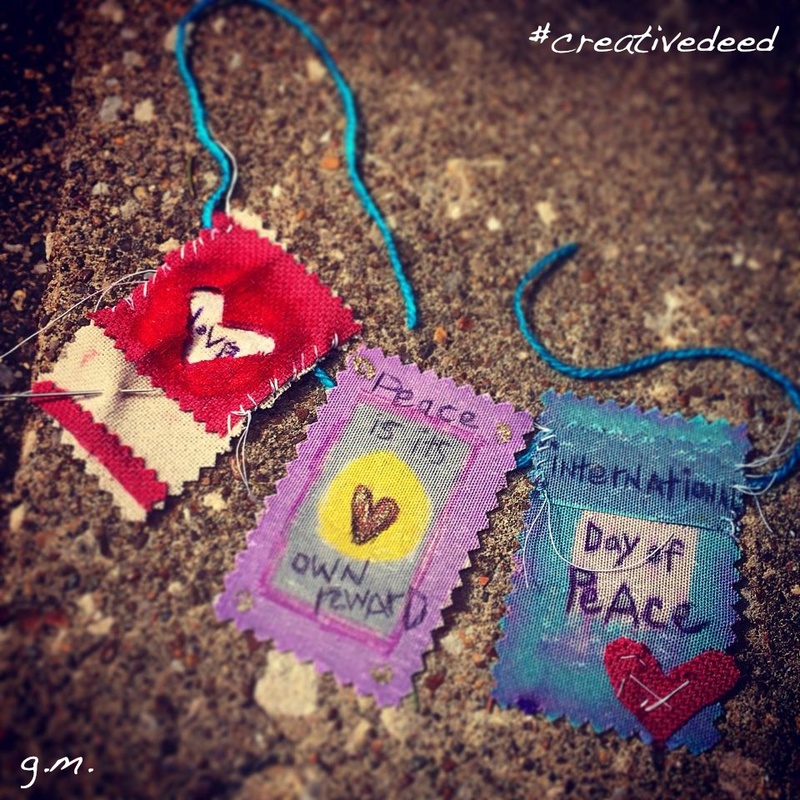 The Creative Deed Team reflected on this CG post and was encouraged to create a Peace Flag to symbolize the power of peace, as well as what peace symbolizes to us and for the world. I used small fabric swatches to create a series of flags using fabric markers, acrylic paint, sharpies and ballpoint ink with some hand sewing. It was not only meaningful and lots of creative fun to work on each of these days for the Compassion Games and to share these good vibes & intentions with others, but it was also really wonderful to connect with everyone on the Creative Deed team through art, service, and reflection over these 11 days. Lots of creative goodness!! I am appreciative of my teammates’ dedication & thoughtfulness, as well as the passion, support, and organization from the Compassion Games. Good times! 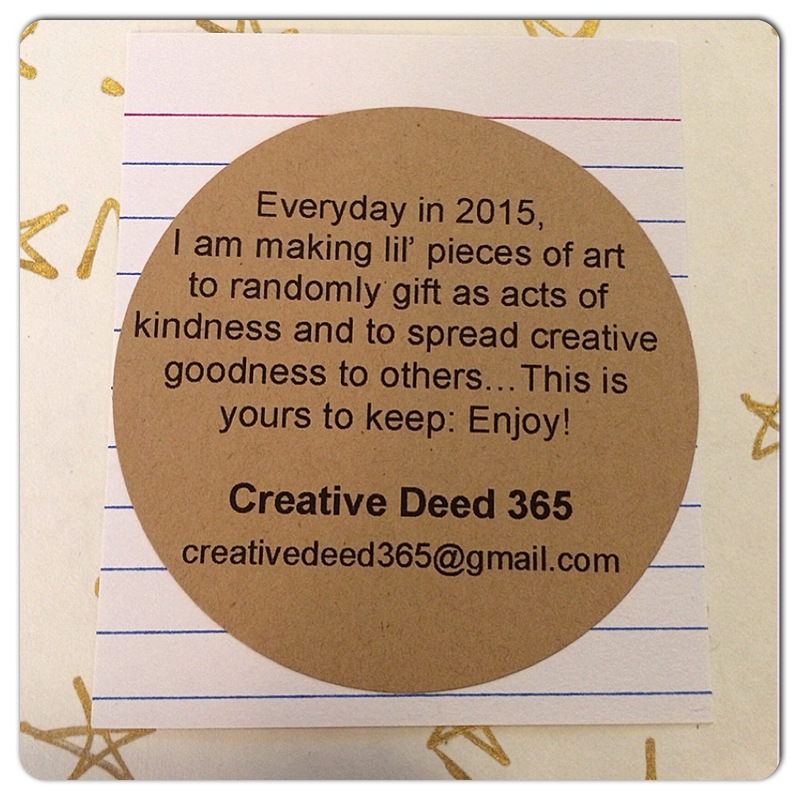 You can see the entire Creative Deed Team Collection on Facebook here. 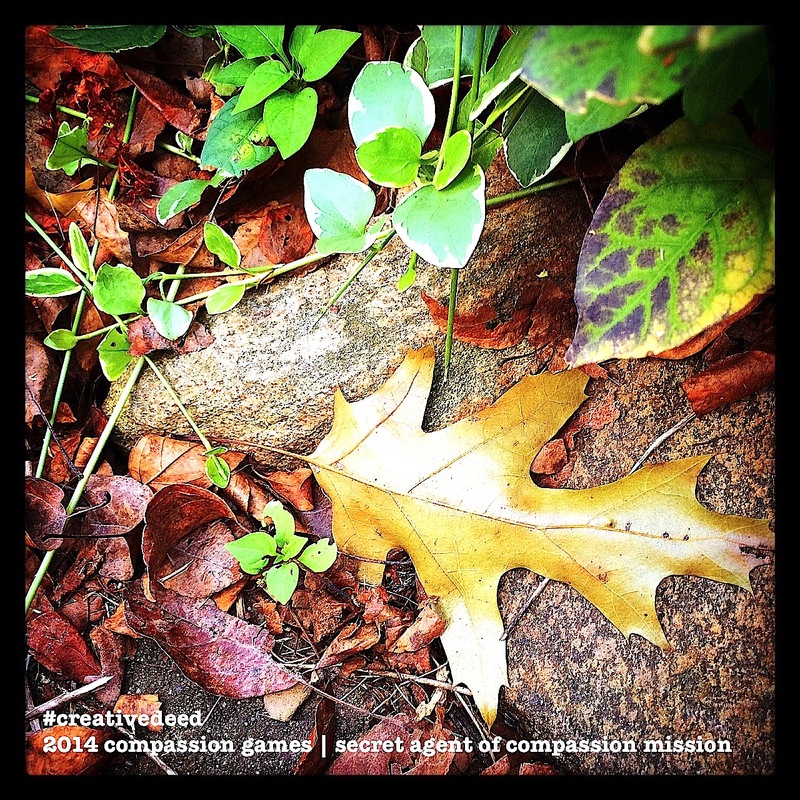 And check out the scientific benefits & origins of compassion from the Charter for Compassion. 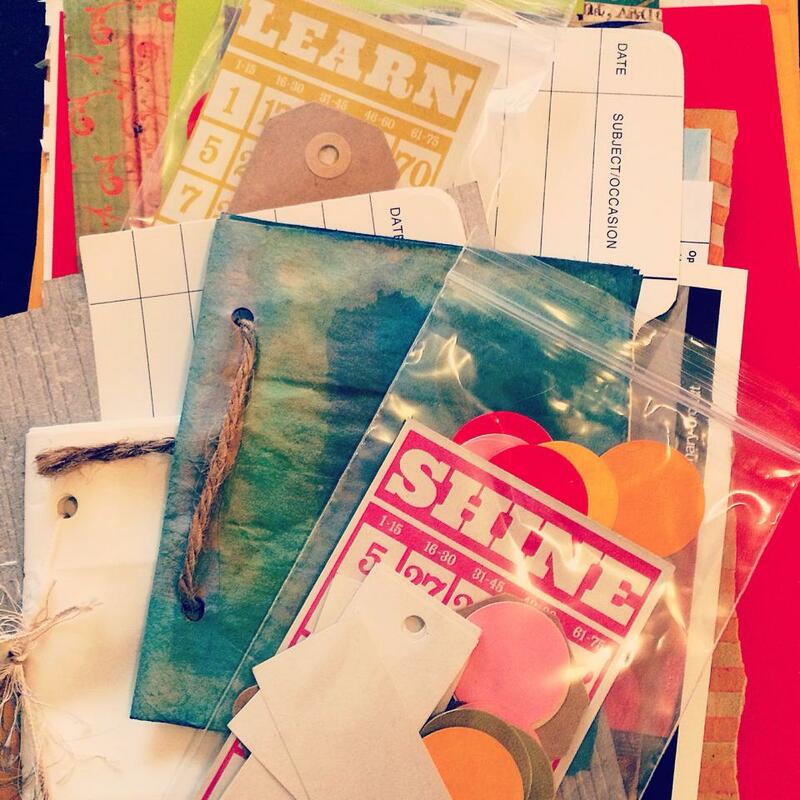 The second part of this Paper Stash Swap is this month’s Show & Tell where we can share what we’ve created with some of the gifts & treasures we’ve received. I’ve used a lot of the stash stuff in my 3×5 365 cards during the past month. It was also really easy to take the stashes (contained in a large mailing envelope or plastic bag) on the go with me to create with. I really thought the patterns, textures, & colors of the stashes I was generously gifted with brought a new excitement and an inviting warmth to my 3×5 art. 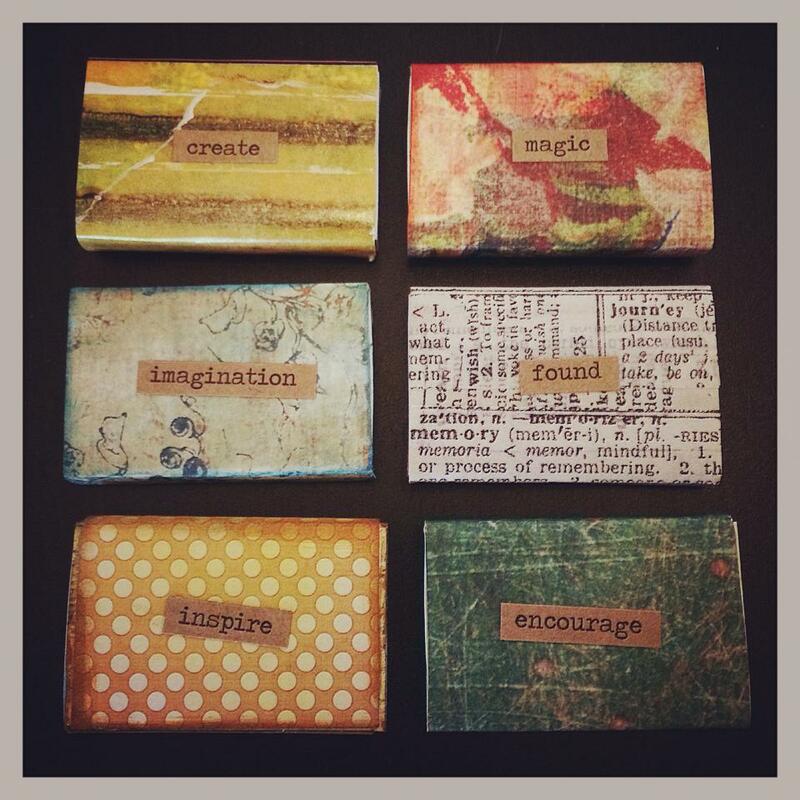 It was a pleasure to begin incorporating these positive elements into my creative practice and feel these meaningful additions come to life (each day and each week). 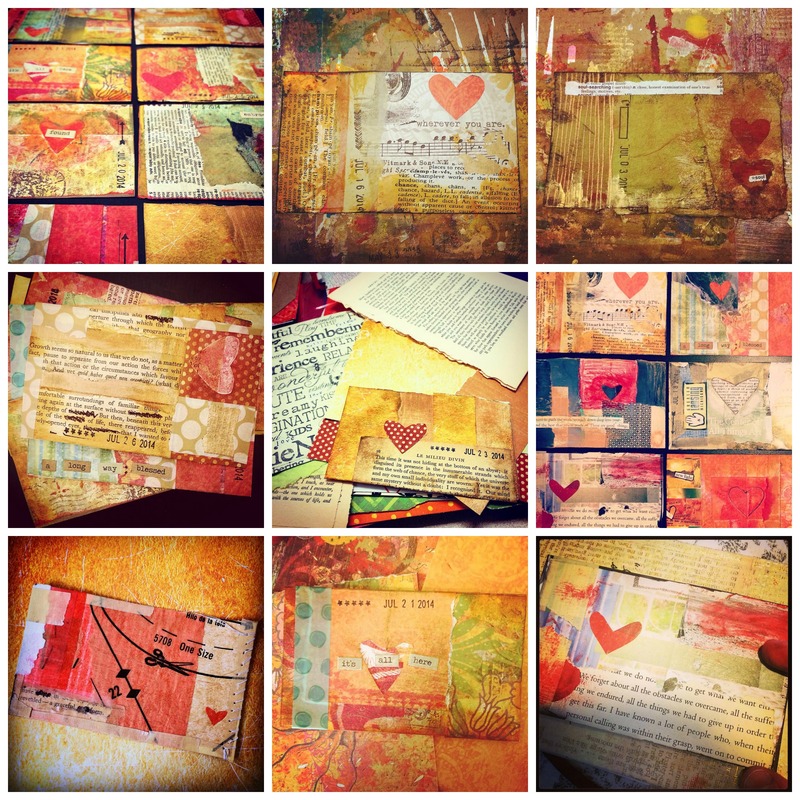 In case you’re looking for your own paper stash inspiration check out some of these ideas from my Creative Goodness with Gluebooks e-book that you can download free here. 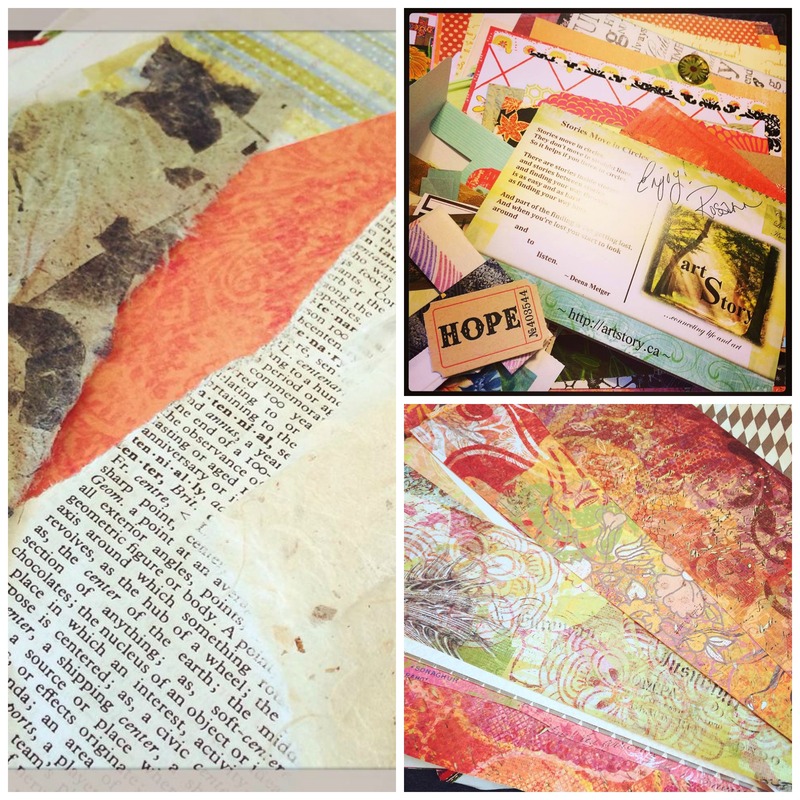 What’s your favorite paper item to use in your stash or to gift to others? 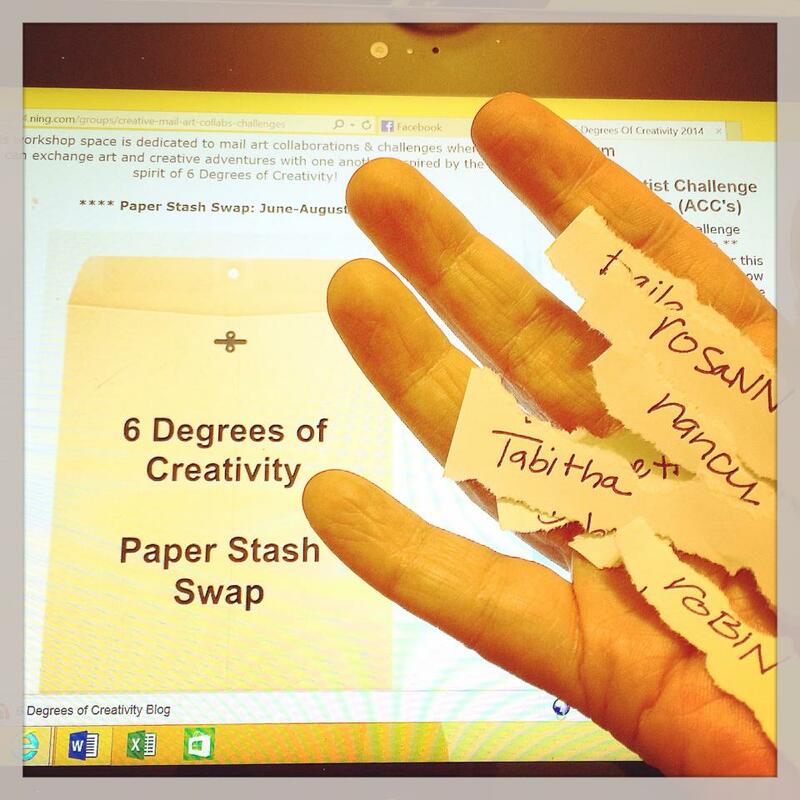 Gluebookers Unite: Let the Paper Stash Swapping Begin!